Do you dream of going to cooking school? Or opening your own bakery someday? 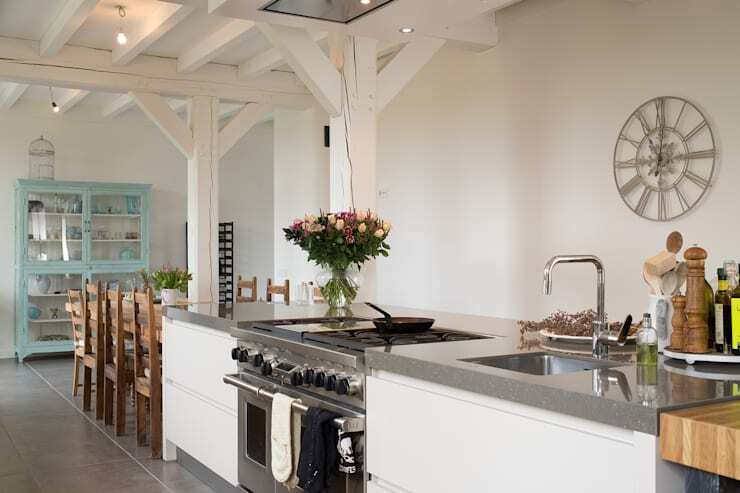 Having a kitchen that rivals the professionals can help budding gourmets realize their dreams. 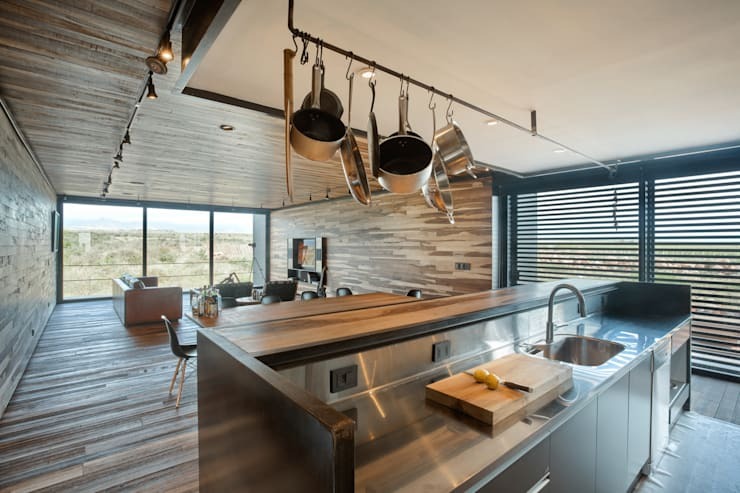 Today we will take inspiration from kitchens with industrial features like stainless steel and learn those elements of a kitchen that make it perfect for amateur chefs. We’ve got a list of 7 kitchens that are styled perfectly for those who want to up their game in the kitchen. Let’s get cracking! This kitchen is fitted like a professional test kitchen at a hotel restaurant. 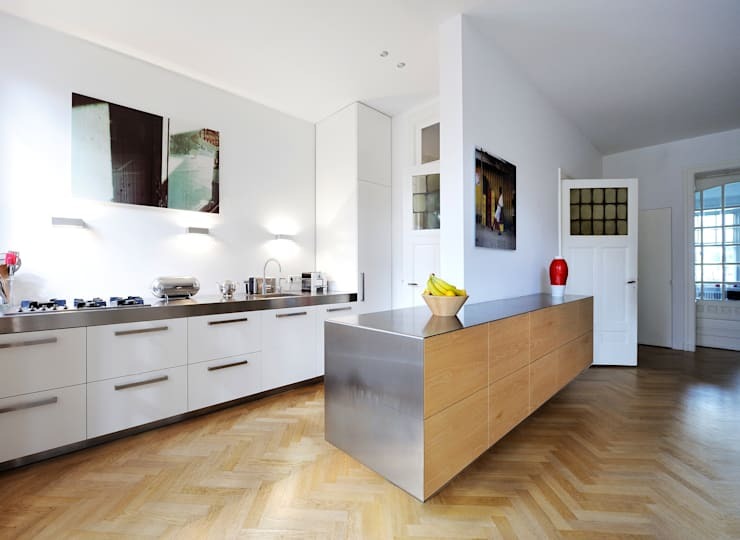 Check out the use of stainless steel for the kitchen island. It gives the kitchen a sleek and professional look. A stainless steel table top is easy to clean and maintain. It has the added bonus of being water and heat resistant. Also in this kitchen, we love the steel storage rack! 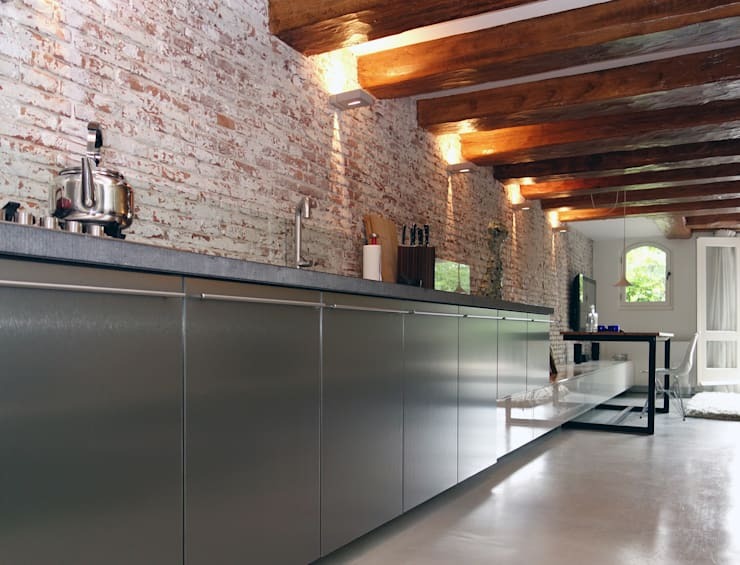 It brings storage to the small kitchen and the design gives the room a chic-industrial edge. 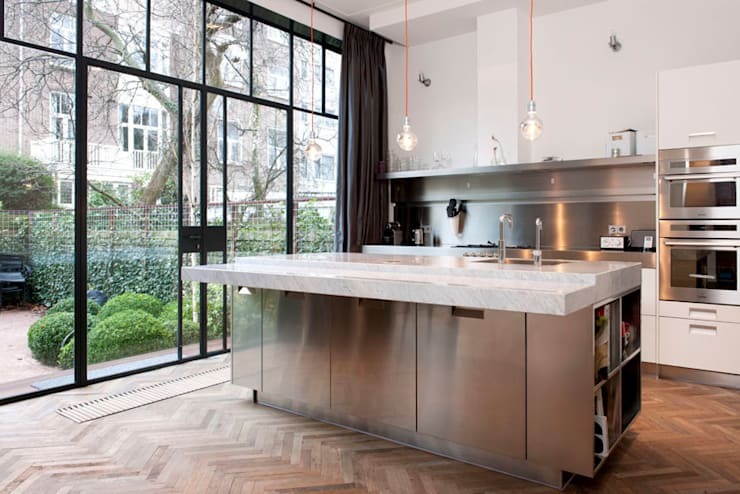 Stainless steel fixtures and worktop surfaces are ideal for budding chefs and gourmets. Real chefs and gourmets have to have a lot of gear. You’ll need a place to store all those appliances, baking sheets, pans, and tools. Make sure you have enough storage space in your kitchen. You don't want to overwhelm it with your semi-professional gear. Experiment with storage solutions to fit everything comfortably inside your drawers and cabinets. In this kitchen, the use of a rack helps keep pots and pans close at hand. Saves you from having to fish them out of cabinets and clatter around for your favourite cookware. A hanging rack like this gives your kitchen an added professional edge! There is a lot of equipment that comes with being a gourmet. Even everyday kitchens are brimming with appliances. Make sure to do your research before buying anything from a coffeemaker to a pasta maker. Read reviews online and shop around for the best prices and warranties. 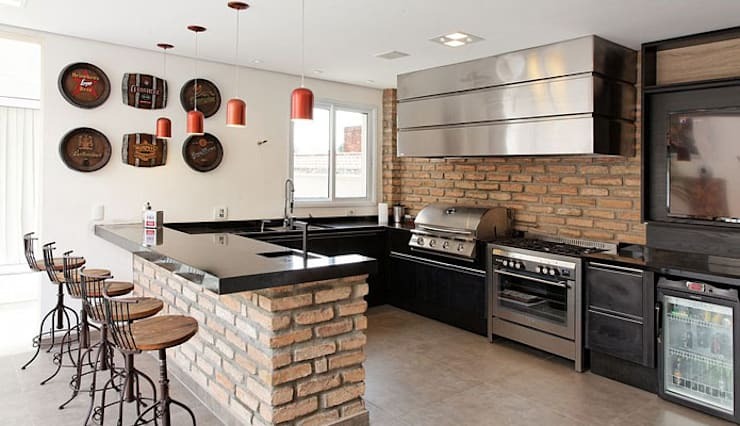 This kitchen is fully equipped with their most loved pieces like that indoor grill. Make room in your kitchen for what you’ll actually use instead of what you would ideally want to use some day. It’s important to have a kitchen that’s easy to use and access. Awkward positions and placements can cause strain and frustration once you’re cooking. You want to be able to move freely in the kitchen and easily get a hold of what you use most. Kitchens for gourmets have enough room for them to get around in and space for a sous chef or two! We love the design of this kitchen because the space flows well and it looks easy to navigate. You can invite guests to have a glass of wine and chat with you at the counter while you work at making a gourmet meal for them to enjoy. There are ways to DIY your way to a better kitchen, but there are also things that need to be installed by professionals Learn what projects you can tackle on your own and when you should contact professionals for help. They can help you choose fixtures and help you make the most of your space. Gourmets like to upgrade their appliances often to get the best even heat on a pan from their stove. Get professionals to help you stall those new appliances! Mess happens. Accidents happen. Even the professionals occasionally drop, spill, and break things on the kitchen floor. Your floors should be durable enough to withstand an impact of a cast-iron pan that slipped from grip. They should be easy to clean so the when the dropped marinara sauce floods the kitchen, it’s not going to stain the floors. The best options for floors are simple non-slip linoleum. It’s inexpensive, easy to clean, and it’s what the professionals use. If you don’t like the look and feel of them, you can opt for laminated wood or stone. Of course, no untreated wood or carpet anywhere near the kitchen! If you want an eat-in kitchen then try using barstools along the counter. It will take up much less space than a table and chairs and helps keep that industrial feel in your kitchen. Make sure your barstools are suitable for the height of the countertops. Barstools are the perfect solution for a professional-grade kitchen at home. 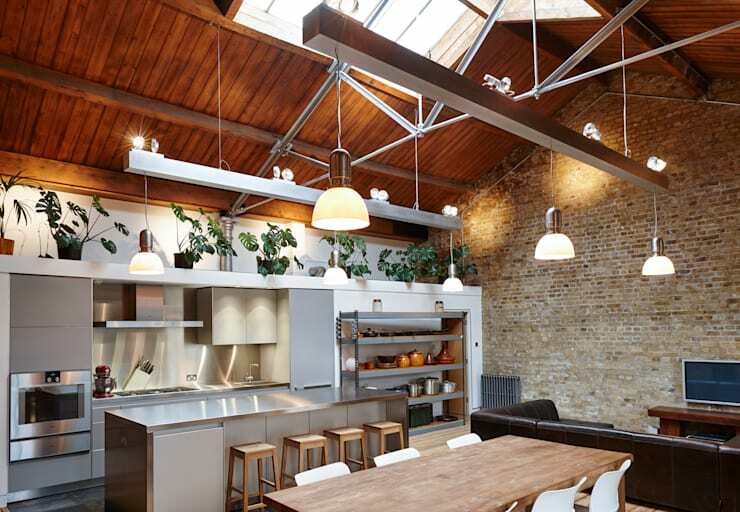 Thank you for taking a look at our guide to styling kitchens for budding gourmets! We hope that you can’t wait to get started in your kitchen. You might find yourself eating out less and less when you have a chic and professional kitchen at home. For more features on kitchens, check out our guide to maximizing storage in your kitchen. What do you need to make your kitchen gourmet ready?